Verah Narh-Kamara is originally from Ghana, West Africa. In 2015, she came to the United States as a study abroad student at Grand Valley State University. 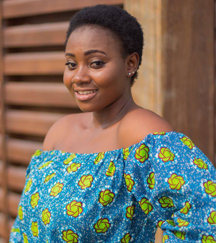 She graduated with a Bachelor’s Degree in Communication with a concentration on Public Relations, Marketing and Advertising from the University of Cape Coast, Ghana. She is currently studying for a Master of Science degree in Communication at Grand Valley State University. Verah is very passionate about the organizational communication and has taken internships and jobs over the years to acquire the necessary skills needed to thrive in that area. Verah joined ELNC’s Program staff last year. With her creativity, leadership, collaborative and organizational, skills and love for ELNC’s Mission. Verah has been promoted to serve as ELNC’s Marketing and Communication Coordinator. In this role, Verah will assist in developing materials and interacting with internal and external clients to deliver an organization’s messages to the public and the media. Prior to ELNC, she has worked and interned with diverse organizations in various fields like Relationship Management, Corporate Communication, and Marketing. Verah is a strong advocate for education and believes in building strong societies through quality and accessible education. She also believes “we rise by lifting others up” and if we all can support each other in our own small ways, society can definitely get better! Verah loves travelling to new places and experiencing new cultures. She also enjoys reading, spending quality time with family at home, and occasionally likes to go to the movies. Verah can be reached at news@elncgr.org. Congratulations Verah and welcome again to ELNC. We look forward to growing with you! !